Trivandrum Rising - Our city tomorrow and how we can help it develop. : Vote for Development....and Why you Should! Vote for Development....and Why you Should! At the beginning very year, I take an informed, albeit often optimistic, stab at what the rest of the year will bring in terms of major development milestones for our city. This year I am still to do that. At first glance, it would seem that the lapse is also on account of the hectic schedule here at MIT, which is the reason why the frequency of posts on this blog has tailed off quite alarmingly in the last few months. However, there is some method behind this particular delay. This is an election year, when the people of Kerala get another chance to determine their fate. And since a lot of the subjects that we talk about on this blog have to do with the powers-that-be who we elevate to their position for five year tenures, I thought it would be best to make this year's forecast after it becomes clear who is left in charge after the electoral storm clears up. I wish that the choice of Government was a rational one, but the truth is that it isn't. We don't elect the best people for the best of reasons. I would like to believe that we don't elect the worst, for the worst of reasons either but the reality of democracy is somewhere in between. Be it the world's largest democracy or the world's richest one, where the elected representatives have just staved off yet another potential shutdown of Government for various trivial reasons. That said, I would like to put forward some suggestions for what you should look for before you cast your vote, if you have any concern for what your City should be like in the future and how well you and your children will live in the years and decades to come. Let's forget socio-religious leanings, political ideologies and personality cults for now and take a look at some of the development issues which should guide your votes.Isn't that one of the most critical responsibilities of an elected Government too, especially in a developing nation like ours, to usher in as much of the sort of social and economical that uplifts the population as possible? As always, I will look at things from the perspective of our City and its surrounding areas and while I can roll off a whole laundry list of things that I would ideally like the next Government to do, I will keep my list to just the five that I think are most important for Trivandrum, not just in the short term, but for years to come. 1. 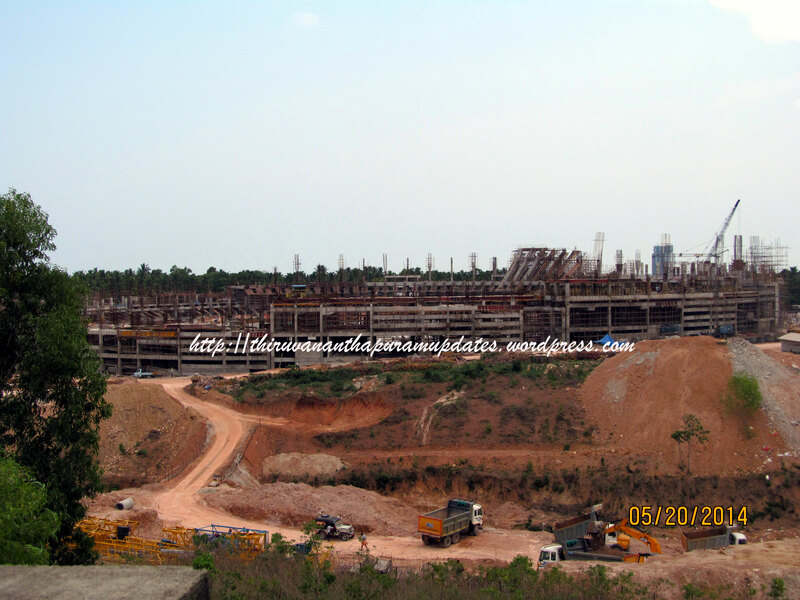 Vizhinjam Deep-sea Port - The incoming Government should be able to complete the ongoing bid process successfully before the end of 2011 and award all tenders for the development of the port and its ancillary infrastructure to capable agencies by the end of the year. It should make sufficient allocation in all coming budgets to provide sufficient funding support to meet the public sector commitments in the Rs 6000 Crore Public Private Partnership project. The Government should also have the resolve to fight it out in Delhi to get all the necessary clearances and Central aid for the project against stiff competition from projects in Kerala and the neighboring States. In short, the project has to be operational before 2015. 2. Technology Industry - There is little doubt that the meal ticket for the City in the near and medium terms is going to depend on the development of the technology industry and the education sector. The latest CII-PwC study has identified Trivandrum as the top technology destination among all Tier 2 cities and the next Government has to keep this growth going by continuing the development of world-class infrastructure. The focus will be on Technocity to create up to 15 Million SF of space over the next 5-8 years but there needs to be significant investment in supporting infrastructure, such as the creation of a "Growth Corridor" stretching from Vizhinjam to Attingal with world-class road, power and water infrastructure. The incoming Government has to accept the fact that Trivandrum accounts for nearly 80% of the State's IT industry and focus on growing it into a hub that can compete with the likes of Pune and Hyderabad, of not with Bangalore itself. 3. Highway and Road Development - That we have missed out on developing our road infrastructure in the recent past is a gross understatement. The Trivandrum City Road Improvement Project (TCRIP) has been the only sign of progress, albeit a very delayed one. But now that the people of Trivandrum have been given a glimpse of world-class roads, it is critical that the NH-47 be widened to 6-lanes with immediate effect, so that the coming flood of traffic from India's biggest container port and a rapidly expanding metropolitan area can be handled without mile-long traffic jams. At the same time, work on the proposed Outer Ring Roads and JNNURM city roads has to start. Most of these projects have majority Central funding but the State Government plays the all-important role of land acquisition. 4. Land Acquisition for Airport and Railway Development - Trivandrum International Airport has just got Kerala's most advanced and biggest terminal building, but T3 is already behind in terms of the growing demand at the airport. The next phases of development on the cityside are desperately needed and the ball is in the court of the next State Government to acquire land for it. The same holds true for the development of urgently needed railway infrastructure at Nemom and the tripling of lines between Nemom and Kochuveli. 5. Urban Infrastructure - While other cities across India have been profiting from JNNURM, Trivandrum has been unable to even make effective use of funds allocated to it and this has to change if the city is going to maintain the standard of living that makes it so desirable over the next decade of explosive growth. While there is a lot of Central funding available for urban development, the State Government decides on how it is deployed and once again is responsible for critical aspects such as land acquisition and planning. Trivandrum had its first mass transit system, a Rs 440 Crore BRTS project, approved in June 2009! It's high time that these and other urban infrastructure projects be priortised in Kerala's biggest and most populous city. So these are five check boxes that your candidate/front's manifesto should definitely be able to check off. I am guessing that some or all of these issues find some mention in many manifestos, probably much lower down the priority list than any of us would like. But do mere promises suffice? Of course not, we all know full well the probability of a manifesto promise coming to fruition. No, I would back up the promises with past records and overall attitude. I will not get into the past records of candidates because some of them have not stood for election in Trivandrum or may not be from the city at all. Case in point being the son of the late Leader. But I will give my opinion on the track records of the two fronts. It's simple, the LDF wins hands down. Not because their leaders were all enamoured of our City and its welfare, with the notable exception of M. Vijayakumar (he deserves a statue of his being put up in a prime location, of anyone alive at this point! ), but because they were unbiased or equally biased with respect to all locations. The LDF let Trivandrum get its deserved share of attention and investment. They did not ignore the sheer dominance of Trivandrum as an IT hub or the natural advantages of Vizhinjam, as the UDF has tended to do. The LDF invested in IT infrastructure across Kerala, a policy that leads even the likes of Karnataka or Tamilnadu, but did not ignore Trivandrum for the benefit of any other city. On the contrary, the previous UDF Government very openly tried to force companies that made a beeline to Trivandrum to locate in Ernakulam at a time when the State Capital still had a chance to catch up with the likes of Pune and Kolkata as a Tier 1 IT hub. The LDF has also not shied away from making public investments in infrastructure, of which Trivandrum together with Ernakulam and Kannur have been the greatest beneficiaries, be it the Rs 450 Crores invested in Vizhinjam or the Rs 800 Crores invested in Technopark and Technocity. So in terms of being unbiased and ready to put the money where the manifesto is, the LDF comes off on top. M.Vijayakumar is not standing for re-election, a crying shame in my honest opinion, but VS is still there as an unbiased CM candidate as are strong leaders like M Sivankutty and C. Ajayakumar (Kazhakkoottam constituency), who are likely to be influential in power, if not members of an LDF Cabinet. Despite allegations about his being anti-private sector, VS has overseen, directly or indirectly, more private and PPP investment than any other CM in Kerala's history. I have interacted with him directly on more than one occasion and I have seen his commitment to worthwhile projects that can really benefit the State and its people, as evidenced by his strong sponsorship of projects like Vizhinjam, Technocity, Kannur Airport and Vallarpadam. Case in point, his strong support for the Government's "landlord" strategy for Vizhinjam and the allotment of 82 acres of land in Technocity to TCS for its Rs 2000 Crore Global Training Center even when his public disagreements with the Tata Group in Munnar are well known. The only plus that I see on the side of the UDF is that a State Government that they may form will have big brother in power in Delhi. Not that we have benefited a lot when the Congress was in power both in Trivandrum and Delhi but I believe that the one man in the Congress who has shown no bias against Trivandrum - A.K. Antony - may be able to work some more of his Centrally funded magic and bring some benefit to the city that has become his home over the last few decades. Additionally, I also believe that the UDF's most likely CM candidate (and there are half a dozen gentlemen who have all given orders to their personal tailors) - Oommen Chandy - will finally realize that IT is not equal to only "Smart" City and that urban infrastructure also means projects other than the "Metro". I wouldn't put my money on this happening but it has become clear that folks in the Capital city have finally started to become more cognizant of what they deserve. I still cannot get over the fact that I cannot cast my vote this time. I have voted in every single election since I got the right of Franchise (except one where my name mysteriously disappeared off the electoral roll and I discovered that only after I flew in from Mumbai on the day of the poll!). But I hope that at least a few of you will ponder over the points that I have made here and will cast your vote in favor of the most deserving candidate/Front. Also, try out this interesting survey which polls your opinion on a wide range of issues and then tells you which party's views and ideology matches yours the closest. It's a joint venture of the University of Kerala, an IT firm and the Center for Democratic Studies. I do not agree with all points in the LDF's ideology (lol, after all, I am a bona fide capitalist!) but it was no surprise what the survey's outcome indicated. Please do not consider this the best way to decide whom to vote for but it is an useful guide to understand where your ideals and values lie on the ideology map of the major companies. This web-site allows both voters and candidates to put up their views, but unfortunately, it hardly seems to have been used. Next time, maybe. Finally, for those of us who believe that our votes don't matter......THEY DO! If we do not exercise our right to franchise, we should not complain about the sort of Government that we get. And remember that the Government determines almost every facet of how we live, work and have fun, and take many of the decisions that could determine how our children and theirs live. So think about it and make an intelligent choice! Amul Babies are the future of the nation. They earn more respect and hold more power than never say die campaigners who have not changed anything. Some people need to earn respect. Bussing it up in Trivandrum!